For those who are ready for the challenge of breaking free from the confines of coastal cruising and daytime sailing, check out LSA’s advanced sailing trips. You will be expected to safely act as skipper and crew of a sailing vessel 40′ in length in coastal waters in any conditions. You and your USCG licensed, Certified Instructor will plan your trip, including the navigation necessary and set the watch bill to be used for the overnight adventure! 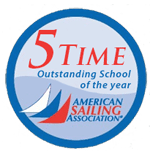 You’ll learn advanced techniques for sail trim and heavy weather sailing. Refer to your Log Book for complete course description! See what fun is going on in your area!